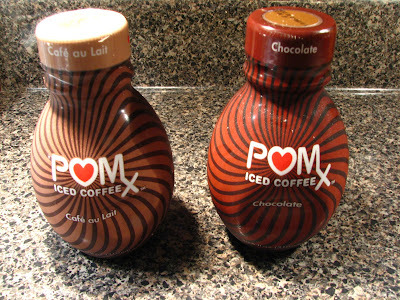 Recently, I was contacted by Janny, the POM Wonderful blogger, about trying their new drink, POMx Iced Coffee. Well, since we are coffee drinkers, and since my 25 year old son and 21 year old daughter often buy coffee drinks to take to work, I said yes, send them on! These coffee drinks contain 650mg of polyphenol antioxidants from pomegranates (but there is no pomegranate taste), so they are healthy drinks. They contain Rainforest Alliance Certified shade grown Arabica coffee beans. So, they sound healthy, but how did they taste? My kids loved them. Actually, I did too. They have a nice rich chocolate taste, and the coffee flavor comes through nicely, not too strong or too milky. We tried the Chocolate flavor, which was my daughter's favorite and the Cafe au Lait, which my son loved. There is also a Vanilla flavor. I'd take either one for a deliciously, creamy coffee break. Price wise, I don't know how this brand compares with other coffee drinks as POMx isn't available in my town yet. My kids both said they will buy this coffee when they can find it. Look for it in the produce department of your local supermarket! SOunds like something I would enjoy too! I will try them and be curious how their price stacks up against the pricey coffee places. I drink plain old coffee - but my children are hooked on the lattes! Sounds good to me. I'm going to give these a try when I see them. Dave, I imagine that POM juice would make a terrific BBQ sauce! Lynda great review! I will give it a try and Dave's suggestion about adding to a homemade BBQ sauce.